-Initial unemployment claims in the United States fell significantly in the latest week, though that may have been largely due to seasonal adjustment problems. Real personal income fell in August by 0.3%, the second monthly drop in a row, while spending was unchanged, causing the savings rate to drop to 4.5%, the lowest since November 2009. Meanwhile, second quarter GDP was upwardly revised while GDI was downwardly revised. -Monthly GDP in Canada rose 0.3% in July, following a 0.2% gain in June. -Preliminary September euro area inflation rose to 3.0% from 2.5%, reducing the probabilty of an ECB interest rate cut. -The employment rate in Germany rose while unemployment rate fell in August. During the latest year the employment rate has risen from 61.9% to 63% while the unemployment rate has dropped from 6.9% to 6%. -Real retail sales in Latvia rose in August rose by 1.6% compared to July and 7.4% compared to August 2010. In Estonia, real retail sales fell by 1% in August compared to July, but rose 4% compared to August 2010. Industrial production fell by 1.8% compared to the previous month but rose 22.7% compared to a year earlier. -Household spending in Japan fell by 2.8% compared to a year earlier, and employment also fell. Industrial production however rose, but less than expected. Do People Earn More Or Less In Texas? Average income in Texas is lower than the national average in the United States. Yet as Tino Sanandaji points out, this is entirely and more the result of the fact that groups that typically have low income, primarily Hispanics, are over-represented in Texas. 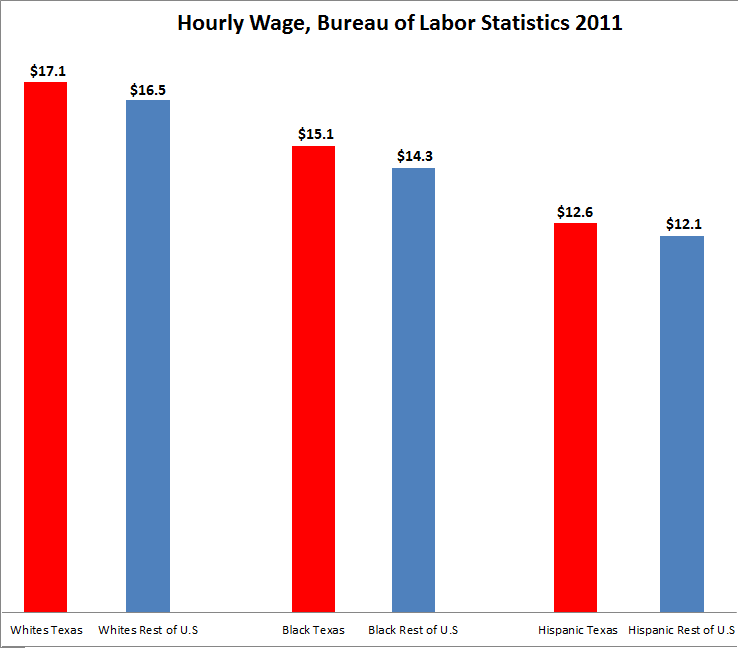 However, Whites, Blacks and Hispanics all have higher income in Texas than in the rest of the country. Adjusting for the lower cost of living in general and lower cost of housing in particular would make Texas look even better. -The Chicago Fed national activity index fell from 0.02 to -0.43, indicating a weaker economy. Durable goods orders also fell, but "core" orders rose. Meanwhile, the housing market remains depressed as house prices and new home sales fell. -Euro area money supply growth rose in August (but remains very low) after having declined for a long time. -The German inflation rate rose according to preliminary estimates from 2.5% to 2.8% in September. (the EU harmonized index). Given the relative strength of the German economy within the euro area and the removal of consumption tax increases from the inflation rates of weaker economies, Germany's inflation relative to the euro area average is likely to continue to increase. -Sweden's trade surplus continued to rise in August, despite the strong Swedish krona. That it increased despite a strong currency is in part due to the J-curve effect and in part due to the domestic demand reduction caused by the Riksbank's tight monetary policy, as evidenced by a continued decline in money supply. -Average worker pay in Hong Kong rose by 6.9% in the year to the second quarter in nominal terms and 1.8% in real terms. -Israel saw its unemployment rate fall to a new low of 5.4% in July. Yves Smith has an interesting discussion about the use of models (no, we're not talking about the good looking human ones, it's the boring mathematical ones)in economics. It could be added that even as many economists have a Friedmanite instrumentalistic "it's the predictions that matter, not the realism of assumptions" approach, their models tend to be pretty useless when it comes to predicting future events. Their definition of "predictions" is instead that the models should be able to "predict" past datasets. Another aspect that could be added is that the users of such "models" fail to grasp the key difference between physics and economics. Models in physics can predict almost all physical events with stunning precision, at least within experimental conditions. Yet as the latest revelation of faster than light particles and previous paradigm shifts (from Aristotelian to Newtonian to Einsteinian to Quantum physics) illustrates, physical scientists appear unable to figure out the underlying causal mechanisms. By contrasts, good economists can through praxeological reasoning describe the underlying causal mechanisms. But even the best economists cannot make exact predictions about future events. The reason why economists knows more about the underlying causal mechanisms is that it follows logically from the axiom of action and other indisputable truths applied to specific circumstances. However, because economics can't make controlled experiments and because so many of the specific factor of specific cases are unknown, precise quantitative predictions can't be made-at least not with certainty. Physicists have by contrast very little axiomatic knowledge to go by and must rely on inductive conclusions from experiments. But because they can make experiments they are usually able to make precise predictions within those experiments. The problem is that most economists believe that they must emulate physics, even though in reality their science is, or should be, radically different. And that is why the make unrealistic models that pretend to be able to make precise predictions, and why they employ unrealistic theories that conform with these models. Often consumer price inflation is described as being just one for everyone. While that is a correct assumption in some contexts, it is misleading in terms of analyzing the effects for different groups-and individuals. For example, if prices on alcohol and tobacco rises substantially, then people who are both teetotallers and non-smokers will see no reduction in purchasing power at all, while people who are heavy drinkers and/or smokers will see a significant reduction in purchasing power. Similarly, if prices of luxury goods rises, then that will have almost no effect on the purchasing power of the poor while significantly reducing the purchasing power of the rich, while higher prices on cheaper forms of food or clothes will have almost no effect on the purchasing power of the rich while significantly reducing the purchasing power of the poor. Sometimes the rich spend more money on certain items, like food, clothes and fuel, yet people with low income might still be hit harder from rising prices of the commodities used, because first of all their income is by definition lower and the spending on these items may therefore still be a higher percentage of their total spending, and secondly because they to a higher extent buy food and clothes whose production costs to a higher extent consists of commodity inputs. Most statistical bureaus around the world either are unaware of or ignores this insight, but Hong Kong's statistical authority has interestingly created, besides the general CPI, three sub-indexes for people with low income (called CPI-A), middle income (called CPI-B) and high income* (called CPI-C) earners. In the latest year, despite having a higher food price inflation, low income earners have had somewhat lower inflation rate than middle income earners, with middle income earners similarly having a somewhat lower inflation rate than high income earners despite having higher food price inflation. It is often claimed that speculators are driving up oil prices artificially. That is a possible scenario, yet it wasn't applicable to for example the recent run-up in oil prices. For speculators to increase oil prices paid by final users they must stock oil in physical inventories, something which they haven't done. Indeed, if you look at the numbers from the Energy Information Administration , it seems that speculation has been holding down prices. Crude oil and gasoline inventories are down by about 5.5% the latest year, while inventories of distillates (like diesel) and propane are down more than 10%. -Britain's August public sector deficit rose compared to the previous year, increasing the debt to GDP ratio to a new high. However, for the April-August period as a whole the deficit fell, though it is still far too high. -Initial jobless claims fell slightly in the United States, but remains at an elevated level. -The official growth rate in New Zealand slowed in the second quarter, to 0.1% (0.4% at an annualized rate) compared to Q1 2011 and 1.5% compared to Q2 2010. However, if you take New Zealand's impåroving terms of trade into account, growth was faster, 2.8% for the latest year (no indication of adjusted quarterly growth can be found, except that it was faster than the headline). Meanwhile, New Zealand's current account deficit rose somewhat due to an increase in the investment income deficit. -Consumer price inflation in Canada in August rose to 3.1% from 2.7% in July. -Euro area PMI fell to a new low of 48.4 in September, while factory orders fell 2.1% in July compared to the previous month. Construction output by contrast rose in July by 1.4%. -Real wages in Germany increased by 1.9% in the second quarter as nominal wages rose 4.2% and consumer price inflation was 2.3%. -Portugal saw its current account deficit fall from €10.4 billion in January-July 2010 to €8.7 billion in January-July 2011, but that is still dangerously high. -Ireland's current account balance in the second quarter was virtually unchanged, but unlike Greece, Portugal, Spain and Italy it has already achieved a yearly surplus, albeit only a small one. Also, Ireland has unlike the others positive economic growth. -Japan saw its trade balance turn from a surplus of 64 billion yen ($0.8 billion) to a deficit of 775 billion yen ($10.2 billion). This is in part likely a result of the strong yen, but mostly a result of the earthquake/tsunami disaster earlier this year incapacitating some of Japan's export industry while increasing the need for imports of goods needed to repair the damage. -South Korea saw employment grow by 2% in the year to August, causing unemployment to drop to 3% even as the labor force participation rate rose. -Taiwan also saw employment increase by about 2%, also enabling a drop in the unemployment rate even as the labor force participation rate rose. At 4.45%, Taiwan's unemployment rate is higher than in for example South Korea and Hong Kong, but still a lot lower than in most Western countries. Meanwhile, wages rose 2.6% in Taiwan the latest year, implying an increase in real wages of more than 1% given Taiwan's 1.3% inflation rate. Undeterred by the utter failure of QE2 in reinvigorating the U.S. economy, the Fed now announces a new "easing"-scheme. This time they will swap short-term to long-term U.S. Treasury securities. Given the fact that short-term interest rates will likely remain basically unchanged while long-term interest rates will fall, this will make monetary conditions "easier" (I.e. more inflationary). As the lower long-term yields will increase demand for credit, this will increase money supply, inflation and nominal output. However, because the increase in inflation could be as big or bigger than the increase in nominal output, real output may not increase. -More signs of stagflation in Britain as real retail sales fall by 0.2% in August compared to July. -The United States also had a stagflationary turn as August consumer price inflation rose to 3.8% from 3.6% while initial jobless claims rose and both the New York and Philadelphia manufacturing surveys indicated contraction. -Euro area inflation was unchanged at 2.5% in August. Inflation falls in the weakest euro area countries like Greece while rising in stronger ones. -Employment in Sweden rose by 2.4% in the year to August, lowering the unemployment rate to 7.4% in seasonally adjusted terms. , from €1.47 billion in July 2010 to €900 million in July 2011. However, given Greece's dire financial situation that is still way too high, and for the January to July period, the drop in the deficit was more modest, from €15.6 billion to €14.2 billion. -Hong Kong saw employment increase nearly 4% the latest year, causing the unemployment rate to drop to 3.2% from 4.3% a year earlier, despite a 2.8% increase in its labor force. Also, its underemployment rate fell from 1.9% to 1.8% during the latest year. Krugman Refutes Own Previous Writing On "Potential GDP"
Paul Krugman correctly notes that the recession has lowered production capacity and will therefore also lower the level of output even in the long term, but of course his conclusions from that are wrong as they assume that Keynesian policies will strengthen the economy. Furthermore, Krugman's new insight means that he himself refutes his previous assertion that "potential GDP" has grown as much as before the recession, an assertion crucial not only to his estimates of a really large "output gap" but also his denial of the big increased in federal spending during Obama (because he put spending in relation to his estimates of a really big "potential GDP). About Mitt Romney's bashing of China for "manipulating its currency" (as if the Fed doesn't manipulate the dollar), one can note one interesting thing. Back in 2005, when New York Senator Charles Schumer (D) along with South Carolina Senator Lindsay Graham (R) first started proposing bills to slap tariffs on Chinese goods, they estimated that the yuan should be 27.5% more expensive and therefore proposed a 27.5% across the board tariff on Chinese goods . Yet China has since 2005 increased the value of the yuan by rougly 30%, from 12.1 U.S. cents to 15.7 U.S. cents (In inverted terms, this means that the dollar has dropped from 8.28 yuan to 6.38 yuan). So according to the estimates of the China bashers themselves, China has already ended the undervaluayion of the yuan and has in fact raised the yuan slightly above fair value. Given that I wrote that lower labor costs are a key to reducing unemployment but that nominal wage rigidity prevents this from happening and given that I wrote that inflation reduces real wages, should we then conclude that inflation will reduce unemployment? Well, it will under some circumstances, but the issue is like the issue of the effects of inflation on debtors not as simple as it seems at first glance. First we must ask us why lower real wages can increase employment. It's certainly not that employers are encouraged to hire more people just because their workers are worse off. No, the reason why it can increase employment is that it means that the difference between the net marginal revenue generated for the employer by a worker and the cost of hiring the worker increases, or turns from negative to positive. Inflation doesn't reduce the nominal cost of hiring the worker, but it could perhaps increase the nominal net marginal revenue generated by the worker. But we should as in the case of the discussion about debtors remind ourselves that monetary inflation doesn't increase all prices equally at the same time. Some prices, particularly commodity prices tend to increase quickly and rapidly, while others increase later and less-or not at all. For companies that sell products that increase a lot in price because of monetary inflation while seeing only small increases in their costs, it will certainly become more profitable to hire more workers and that's what they'll do. We can see this in current employment statistics. While overall payroll employment rose slightly less than 1% in the latest year in the United States, employment in the mining sector has risen as much as 13%. This is clearly a result of the high commodity prices. However, many other companies haven't seen the prices of the products they sell rise as much or anything at all. Meanwhile, the prices of their inputs have risen because of the same commodity price boom that has benefited the mining sector. As a result. the marginal net revenue that their workers generated have increased far less, nothing at all or even declined. Accordingly, in other sectors inflation will generate far less or no jobs at all or could even mean that they will be forced to reduce their workforce. And because America, despite the recent boom in its mining sector, is still a large net importer of commodities, it is dubious whether the recent increase in inflation has really, outside of the growing but relatively small mining sector (less than 0.6% of workers work in the mining sector), created more jobs than it has destroyed. What is clear is however that any positive net effect is much smaller than you would normally expect with such a big drop in real wages. Matthew Yglesias wants more inflationary policies to increase real wages. That's like starting a fire to make things cooler. The Fed last year did pursue the kind of policy Yglesias wanted (QE2). That was indeed successful in increasing inflation, as consumer price inflation rose from 1.2% in August 2010 to 3.8% in August 2011 . But as the nominal increase in hourly earnings was basically unchanged, this lowered the change in real hourly earnings from 0.7% to -1.9%. This is a very expected outcome considering that wages are more sticky than most prices, particularly food and energy prices. -Britain's economy continues to be stagflationary, as consumer price inflation rose to 4.5% in August while industrial production in July fell compared to both June 2011 and July 2010. Meanwhile, the British trade deficit was unchanged. Meanwhile, the British employment rate fell in May to July to 70.5%, down by 0.2% compared to the previous quarter and by 0.3 percentage points compared to a year earlier, while unemployment rose. The nominal rate of wage increases rose to 2.8%, but with inflation at 4.5% that still means that real wages are falling. Also, in August the number of people receiving unemployment benefuts continued to rise. -Producer prices in the United States were unchanged compared to the previous month, but compared to a year earlier they were up 6.5%. Meanwhile, nominal retail sales in August were unchanged compared to the previous month but up 7.2% compared to a year earlier. With inflation at around 3.5%, real retail sales are likely up also around 3.5%. -Im contrast to many other bullish signs, employment fell slightly in Canada in August compared to July while unemployment rose. However compared to a year earlier the picture is brighter with employment up and unemployment down. -Contradicting the bearish signals from manufacturing surveys, the Swedish statistics authority reported increases in both industrial production and factory orders. Meanwhile, Swedish consumer price inflation was unchanged at 1.6% (the EU harmonized index). -Also contradicting manufacturing surveys, euro area industrial production rose in July by 1% after falling by 0.8% in June. -Estonia's foreign trade continued to grow rapidly, with exports up 34% and imports up 38% compared to a year earlier. Although this growth rate is slower than previously this year, this slowdown is largely the result of base effects. During 2010, the first year of the official "recovery", real median income in the U.S. fell by 2.3% compared to 2009 while the poverty rate rose from 14.3% to 15.1%. The explanation for this is in part that these calculations use the consumer price index while GDP numbers used "chained price index" that systematically produce lower inflation estimates (and therefore given certain nominal income estimates, higher real income estimates), in part that the economic growth supposedly taking place really didn't happen considering the deterioration in terms of trade, and in part due to the fact that high income earners received more than the entire increase in aggregate real income that after all did occur. Karl Smith thinks the below chart from David Altig disproves the Austrian explanation of the U.S. recession. There are several problems with this. First of all, the housing bust didn't just hurt the overall economy because construction employment declined. Even more important was the effect of falling house prices. Secondly, because the crisis in the overall economy was the lagged effect of the housing bust, some of the decline in construction took place before the recession. And thirdly, the chart is misleading for several reasons, including the aforementioned lagged effect, the fact that it represents change in terms of number of jobs and not percent and even more importantly the fact that it doesn't include the recession! The Y-axis represents employment change during the so-called recovery and excludes change during the most intense contraction period (Which is why manufacturing is doing so good). Analyzing a contraction without including the contraction is bound to be misleading. Last week I discussed the increasing spread between the two types of oil known as WTI and Brent, the former being the most popularly quoted while the latter is the most important for the global economy. As you can see in the below chart from the Energy Information Administrations "This week in petroleum", the difference has been very small in the past, but is now very big. I am not exatly enthusiastic about Obama's new job plan, which is mostly just more of the failed policies he has pursued in the past. There was one mostly good part though, in the form of a reduction in the employers payroll tax. Given the fact that due to wage rigidity, labor costs have fallen insufficiently to solve unemployment, a payroll tax reduction that reduces labor costs is just what is needed. The fact that it is limited to the first $5 million could however create some distortions, making even this part less good than it could be. Still, it is despite that a mostly good thing. As I wrote last month, putting your trust in a fiat currency asset as a safe haven is foolish because, among other things, the central bank that creates it will not like it and act to debase it. This truth was illustrated today when the Swiss National Bank declared that they wouldn't tolerate a franc value above 83.3 euro cents (which in the usual inverted terms means that the euro can't drop below 1.2 francs) and said they would pledge "umlimited amounts" to enforce this new ceiling. This have been very effective in the short term and the franc is now below the ceiling of 83.3 euro cents. Just how effective ut will be in the long term remains to be seen however given the effects of intervention on the balance sheet of the Swiss National Bank. It's best hope is that the ceiling will make investors voluntarily abstain from pouring money into franc assets. Because if they don't, the losses of the Swiss National Bank might become unbearably high. Today is Labor day in America, so it might be time to remind us that there is unusually little of labor these days. For those who have kept their jobs (or gotten new ones) average real weekly pay has been basically unchanged during the same period as a whole. Probably inspired by the wave of protests in certain Arab countries, and/or by protests in Greece and certain other debt ridden European countries, a protest movement has arisen in Israel against what it calls "social injustice". Though it is probably largely explained by these other movements, it is nevertheless largely illogical and incomprehensible. Unlike the Arab countries, Israel is democratic. And unlike Greece and other troubled European countries, it hasn't implemented any austerity programme. And unlike the vast majority of countries in the world, Israel has a record strong economy, with unemployment at an all time low and with strong economic growth even after it escaped the 2008-09 global slump with a mere slowdown (though a significant one) in growth. And no, none of the demands issued by this movement really concerns (other than at most indirectly) Israel's relations with the Palestinians or other Arabs. So, the creation of this movements seems really incomprehensible and certainly irrational. It has often been asserted that its goal is to "lower the cost of living", but while that is probably the goal of some of those participating in it, it is clearly not the intention of the leaders as they have ignored or rejected rational solutions to this, like making monetary policy less inflationary and removing regulatory obstacles to increases in supply of the things (like housing) they say are too expensive. Instead, the objective seems to be to force the Israeli government to reverse the successful free market policies that Israeli governments since the 1980s have pursued to liberalize the Israeli economy and make go back to more socialist policies. That would be a serious mistake as it would imperil the dramatic economic progress Israel has achieved since the 1980s. And since that would in turn weaken Israel's clout and make its defense less affordable, it would endanger Israel itself. This means that the "social justice movement" is as big a threat to Israel (and [de facto even if unwittingly] collaborating with) as Iran, Hamas and Fatah. Fortunately for Israel, it seems though that while the protestors may make a lot of noise, they don't have any public support. Hopefully, this will prevent Netanyahu from caving in to the protestors socialist demands. In the Energy Information Administration's latest "This week in petroleum" there is one interesting detail. During the latest year (or year to August 26), the price of the most commonly quoted form of oil, the West Texas Intermediate (WTI), is up only 13% (from about $75 per barrel to about $85), while the price of crude gasoline is up 50% (from $1.95 per gallon to $2.94). The price of crude gasoline has thus seemingly increased by a third relative to the price of crude oil. Since gasoline is based on oil, how is that possible? I am not entirely sure and there are probably several explanations, but one explanation that is consistent with recent price history is that the pricing of gasoline isn't based on WTI, but rather on Brent crude. Typically, the price difference between WTI oil and Brent oil is small, but the latest year it has increased to more than 30%. If this is the explanation then one should really question why WTI is the price that financial web sites focus on, since it seems that Brent is more important. Like many previous employment reports, the August 2011 U.S. employment report contained mixed signals from the household and the payroll surveys. Except that this time, the household survey was actually stronger. The household survey showed a gain in employment of 331,000, following a cumulative decline of 483,000 in June and July. This illustrates why it is probably less reliable than the payroll survey in terms of monthly fluctuations. It could be noted that the yearly increase is still a lot weaker than in the payroll survey (up 0.25% versus a 0.95% gain in the payroll survey). The payroll survey by contrast showed no change in employment after several months gain. What made the payroll survey even weaker was a 0.4% drop in average weekly earnings (composed of a 0.1% drop in average hourly earnings and a 0.3% drop in the average work week) that given the flat employment number also implies a 0.4% in aggregate labor earnings. A upward revision in previous numbers however partly offset this weakness. It is generally assumed that higher house prices are good and that lower house prices are bad. Matthew Yglesias here points out that this is not always true. But while I basically agrees with his conclusion, his analysis is inadequate. The assumption that house prices are better if they are higher rests largely on the fact that most home buyers borrow most of the money needed to buy the houses, and if prices falls after that then the mortgage debt could exceed the value of the home, creating problems for the home owners and/or the mortgage lenders. By contrast, higher house prices will seemingly create new wealth for the home owners and more or less eliminate the risk that the mortgage lenders will suffer losses. Furthermore, higher house prices will make it more profitable to build new homes, creating a boom in the construction sector. These argument are true as far as they go. however there are downsides to higher house prices. First of all, higher house prices will all else being equal make it necessary for new home buyers to take on more debt, thus increasing the risk that they and their lenders will suffer from debt related problems in the future and also increasing their debt service payments. Thus, while higher house prices reduces current debt problems, it increases the risk of future debt problems. And while higher construction activity is normally a good thing given a certain level of production of other goods and services, it could crowd out other production. And if there is excessive activity during a certain time, it could create adjustment problems when activity falls as workers and other factors of production often can't quickly move to other lines of production. In short, there are pros and cons with higher house prices. This is also true more generally speaking regarding price changes. All else being equal, higher prices are generally good for sellers and bad for buyers. However, if dramatic price changes up or down creates malinvestments, debt problems and other adjustment problems then they might be bad for both [most] sellers and buyers. On the other hand, positive productivity driven price changes might benefit both buyers and sellers. If for example, crops for farmers improve, then farm income might increase even though food prices fall, meaning that both sellers and buyers of food products benefit. Similarly if workers for whatever reason becomes more productive then they can receive higher wages even as the profits of their employers increase, meaning that both the buyers and sellers of labor gains. In short, whether or nor price changes are good or bad depends on first of all whether you're look on it from the perspective of the buyer or the seller. And secondly on if it could later cause adjustment problems. And thirdly on whether it reflects productivity changes.